Best Gun Cleaning Kit Reviews - Comprehensive Reviews! Increasing the performance of your firearm as well as lengthening the life span can easily be achieved with the right gun cleaning kit. Wear and tear can be significantly reduced by scheduling a home maintenance or service on your weapon. Even if you don’t use your gun every day or even every week it is important to clean it regularly of any dust, dirt and debris that can accumulate in storage. In this case of the rare user it is vital to ensure your gun is clean and ready to perform when you do need it. No one wants to be caught out with an under performing gun. In the following post I’ll highlight and review the best cleaning kits for guns as well as key information for keeping your firearm in top condition. For advanced gun owners this kit includes all the necessary items needed to clean all of your guns. With over 60 pieces this complete kit also includes a convenient portable case. Suitable for an armorer but used by thousands the kit can be used for breech-to-muzzle cleaning for rifles, pistols, shotguns and inline muzzleloaders. The 22 bronze brushes are high quality with the caliber engraved on each rod for ease of use. Every item has a storage allocation in the carry bag and if you misplace or break a brush you can easily find a replacement. Included in the brass scraper tool set are a scraper, a locking lug scraper, a straight pick, a pin punch, a nylon end brush, a compact receiver brush and two rod handles. No need to worry about scratching your firearm these tools can thoroughly clean those hard to reach places including the locking lugs, the slides, bolt face and rails. A lens kit is included preserve the functionality of lenses including scope, rangefinders, laser sight devices, binoculars, cameras as well as general eyewear pieces. The kit includes a mohair lens brush, premium anti-Fog lens cleaner, anti-fog lens swabs, premium lens tissue, and an otis lens cleaning cloth. All of these items are stored in a durable, high quality nylon carry bag with a strong zipper. While some prefer a solid case, the nylon carry bag makes it easy to cary and transport. 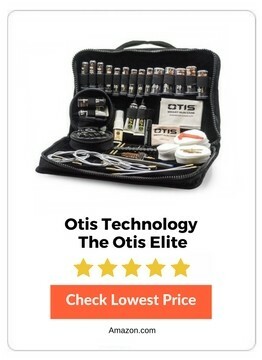 Although this kit includes 2 x 5 ounce tubes of Otis O85 Ultra Bore solvent I recommend purchasing an additional solvent. Also, some cotton swabs are considered an important gun cleaning tool as well so including these would complete the kit. A complete, universal gun cleaning accessory kit that can be used with shotguns, rifles and pistols in a lightweight yet durable plastic case. Included are all the vital tools needed to make sure your gun can be properly taken care of. The only additional products you will need is the cleaning oil and solvent. Universally accommodating for any time of firearm this kit can be used to clean pistols, .30 caliber rifles, shotguns and muzzle loaders. With brass rods for any .17 to .27 caliber guns as well as strong nylon plastics the quality of the rods is fairly high given the price. Industrial ABS plastic has been used for the case which is specifically molded to fit all the contents. With plastic snap locks your case can be secured shut and the molded carry handle makes it easy to transport. Included with the purchase is a 3 year warranty which is a testament to their product quality and customer service. This is a high quality, well organized, universal gun cleaning kit. With everything you need as well as a durable, convenient carry bag this kit is one of the most popular on the market. 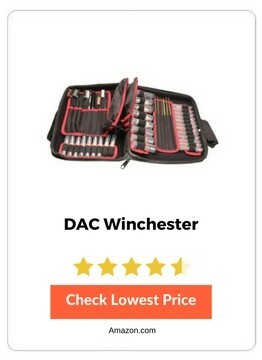 Truly a complete set the DAC Winchester is a deluxe universal cleaning set that includes all the key accessories. The durable carry case has removable handoliers and accessory pouches along which a dedicated section for every item. It must be noted that this kit has space for but does not come with a bore snake, cleaning solvent or lubricating oil. In terms of finding a universal gun kit this is a highly rated and highly versatile option. 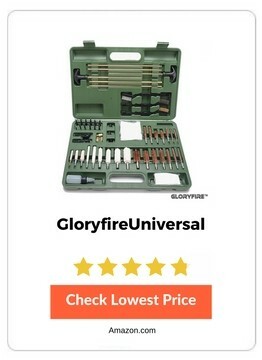 With great customer reviews and at a very reasonable price if you want a kit that can service all of your guns then this is a great choice. A premium gun cleaning kit this is well suited for handgun owners. The Gun Boss Handgun Cleaning Kit is a complete cleaning system, this can easily be transported for use in the field, range and from home. The case itself is compact enough to fit in your pocket, making it easy to transport. Made from durable ballistic nylon each tool has a designated area within the case. This kit is best designed for handguns such as 9MMs, most glock pistols, 1911s and .22 calibers. There is also a large range of calibers that it can be used with including .22, .357, 9MM, .38, .40, and .45 Cal. pistols. A quality kit with all the essentials you’ll need for an effective and efficient clean. Made from high quality materials the Outers Uni Gun box comes in a sturdy, aged oak finished box that has all the necessary parts. Suited to beginner and intermediate gun owners this kit comes with a large variety of brushes for a large variety of calibers. The aged oak box is one of the positives of this quite. Durable and strong, this is an attractive yet highly functional kit. Kit includes the required tips, mops and brushes for a complete clean of your firearm. Well divided the kit provides easy access to your tools. This kit does not include any lubricant or cotton swabs so consider purchasing these separately at the time of ordering. In terms of value for money this is one of the lower priced kits on the market and the quality is reflected in this. There have been a few issues with rods bending and breaking as well as the jags being made from plastic as opposed to brass. 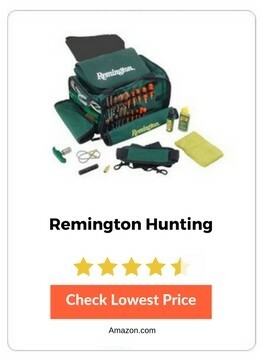 The Remington Hunting Kit is a competitively priced cleaning kit that can service a variety of firearms. Encased in a vinyl zipper kit, there is space for all the cleaning tools you need. Each brush has the caliber inscribed on it which makes it easy to distinguish which to use with your guns. The Rem Squeeg-es and bronze bore brushes are .22/.223/5.56mm, .243, .270/7mm, .308/7.62mm, 9mm/.380/.357, .40/10mm, .44/.45, .50/.410, 20GA/28GA, 12GA/16GA. The squeeg-es are unique to this kit and work well to clean any residue left over from the bronze bore brushes. Complete with a sturdy, well organized bag with secure zippers this makes for a great hunting companion. The front has space for all the Squeeg-Es and brushes, right pocket holds the cables as well as T handle and some brushed. The left pocket holds the Rem All In Bore Cleaner, Rem Oil, and a gun cloth. The centre of the bag has a pad that you can clean your weapon on. 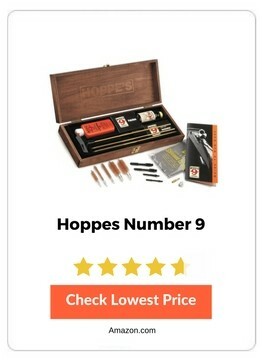 Hoppes offer a few different gun cleaning kits but the number 9 kit is hard to overlook. A simplistic, 18 piece kit this is ideal for a beginner gun owner. Affordable this kit includes a solid wooden case to house all the tools. This kit comes with a gun bore cleaner which is effective at removing powder, lead, metal fouling and rust. Included with the kit is a beginners manual on how to use each tool for various firearms. This kit doesn’t include all of the tools necessary to clean a shotgun, 9mm or .45 brass piece so if you have these guns consider purchasing a different kit. With fairly sturdy components this kit is a budget model that still presents value. 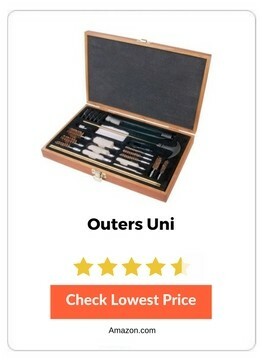 There have been a few complaints regarding the quality of brushes but at this price you can’t really complain. Every gun cleaning kit will vary slightly but there are a few key items that are common across them all. A variety of bronze brushes should be included with every kit. This tool is used as a first pass down the barrel of the gun which will remove any carbon build up. There are varying quality of bronze used in the brush bristles, the highest quality bronze is going to yield the highest quality results. In areas that are a bit more sensitive a nylon brush should be used instead of a bronze brush. Nylon is a lot softer and therefore safer to use in these areas and are ideal for carved out areas as well as hard to reach places. Also referred to as a gun mop these are made from cotton and are used to remove any residue in the barrel. Ideal for removing any access oil which may be present in the barrel of the firearm. For cleaning the centre of the jag, this is a cotton cleaning patch that provides a 360 degree clean with bore surfaces. There is a specific item for this task as most jags are brass or nickel plated which stop any scratching of the inner barrel. For this step it is crucial that any solvent is removed otherwise it can dry and result in the metal rusting. If the kit doesn’t include a cleaning jag then it will include a patch holder. This essentially functions in the same way as a cleaning jag by placing cotton on the end to absorb and remove any excess solvent. Cleaning patches are dipped into cleaning solvent which is then placed on the jag or patch holder. From here, you push it through the gun chambers and bore with a jag. There are a wide variety of materials as well as thickness available so depending on your gun it is important to match these values. Used for detailing firearms, the elongated wooden handles are useful to push down the barrel of a gun. Generally speaking they come with a 6″ wooden handle. Similar shape to a toothbrush these brushes are attached to your cleaning rod and used on the external parts of your weapon. Depending on the quality of your cleaning kit the material can be stainless steel, nylon or brass. The cleaning rod is the most important and useful tool in your kit. All of the components listed are attached to the cleaning rod for use. Used to clean and lubricate your gun, this product is also known as CLP. Vital to the longevity and efficiency of your firearm, a good cleaning solvent is important. There are a variety of products and types so understanding each one is a key. While a bore snake is not to be substituted for a cleaning regime they are a a good tool for a quick clean of your gun. Bore snakes are suited to different calibers. When deciding on the best gun cleaning kit for your needs there are a few key things to consider. Many gun kits are suited to a range or certain caliber guns. If you are looking for a specific kit for a specific caliber then be sure to match these before buying. For those wanting one kit to clean all of their guns be sure to find a kit that covers a variety of caliber sizes. Considering you want to be cleaning and maintaining your gun regularly it is important to become familiar and comfortable with each tool. Researching each tool with care is a good way to get used to each tool and its’ use. Like many things, the more you spend the better quality products you will get. While there are many gun cleaning kits on the market I have compiled what I consider the best products to make the decision easier for you. I do recommend that you further research and read customer reviews before making your final decision. In terms of storing all your cleaning tools you want a solid, sturdy case for them. Keeping your cleaning tools protected and preserved is important to provide the best care for your firearms. If you aren’t happy with the casing or housing of your kit there is the option to buy a specific gun cleaning box. Guns really ought to be cleaned after each use. Once you have selected your cleaning kit and familiarized yourself with the components you need to set a regular maintenance schedule. It is not difficult to clean a gun but definitely requires a bit of practice to master the task. Here are a few recommendations. Learn how to disassemble your firearm if you don’t already know how. For guns such as handguns you can easily take it apart and clean each piece. This varies from gun to gun but to some extent you can remove parts. For safety purpose ensure your gun is unloaded before cleaning. Ensure your area is well ventilated or well aired. This is because the solvents used for cleaning are made from fairly strong and potent chemicals. Breathing in these fumes is not advised so outdoors or near windows is the ideal cleaning spot. Take care when handling these products and chemicals. Follow the safety prompts in the case of emergencies. Residue from the firing process begins to build up down the barrel so focusing on clearing this out is important. Cleaning the barrel is done with the bronze brushed provided in your gun cleaning kit. Attach the brush to the cleaning rod, apply the solvent and push the brush forwards and back. After cleaning the debris and residue from the barrel you can then attach a cleaning patch and apply gun oil to it. Push the patch forward and back through the barrel to provide a protective layer in the barrel. Solvent can be used along with the patches to wipe down the exterior of your gun. Once you have done this you can also apply a layer of oil to further protect the gun. As well as cleaning the barrel and exterior, if you have a revolver you can clean the chambers. In addition to the long barrel there are five or siz shorter barrels which make the chamber. Cleaning the chambers is done in the same way you clean the barrel. As mentioned it would be ideal to clean your gun after each use. If this isn’t feasible then aim for once a week or fortnight. For those storing their guns long term, clean it before going into storage. Personally, you can’t over clean your gun and the efficiency makes it worth the regular cleaning. Maintaining and cleaning your firearm will improve the efficiency, performance and reduce wear and tear. Through regular maintenance with the best gun cleaning kit your gun will look good and perform well with every use. Through this guide you now know the tools included in a kit and a basic overview of how to clean your weapon. Ensuring your firearm is lubricated and clean is the best way to extend the life of your weapon as well as increase the performance. While there are many gun cleaning kits on the market I have highlighted the best products in this review. Welcome to Guns & Safety Reviews, we have the latest reviews covering the best gun safes, gun safety equipment and gun accessories. 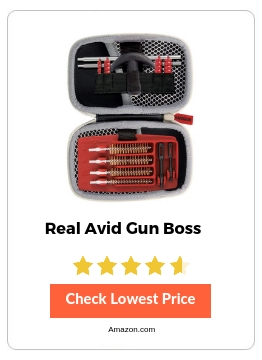 Thegunsafes.net is a participant in the Amazon Services LLC Associates Program, an affiliate advertising program designed to provide a means for sites to earn advertising fees by advertising and linking https://www.thegunsafes.net/ to Amazon properties.